Dual listed uranium developer, Berkeley Energia (ASX: BKY, LON: BKY) announced on Friday that it had raised £24.1 million (circa US$30 million/AUD$39 million) at a placement price of 45 pence. This is at the top end of the range (US$25 million-US$30 million) which the company flagged at 6 PM on Friday. It should be remembered however that this is still an early stage, small cap stock so investors should seek professional financial advice if considering BKY for the portfolio. The placement price was broadly in line with its previous closing price on the AIM of 45.5 pence, which reaffirms management’s comments that the placement was strongly supported and oversubscribed. BKY entered a trading halt last Friday pending the placement and is yet to trade on the ASX post-raising, but since the details of the capital raising were announced it has traded in London as can be seen below. Its shares finished up nearly 5% which could be a lead as to how this news will be received when the company recommences trading on the ASX. BKY’s managing Director, Paul Atherley said, “The funds raised will be used to bring forward the construction of the crushing circuit and other facilities associated with the main construction to early next year”. He also highlighted that the endgame was to establish the mine as one of the world’s lowest cost uranium producers, providing reliable long-term supply for customers in the European Union. BKY’s assets are ideally positioned to fulfil this goal, being based in Spain and when in production it will be Europe’s only major uranium mine and one of the world’s largest producers supplying over £4 million of uranium concentrator year, equivalent to approximately 10% of the continent’s total requirement. Finfeed has profiled BKY in recent months as one of the best emerging prospects in the uranium sector. The following provides a comprehensive review of the events leading up to the capital raising, the prospects for both the uranium market and BKY, as well as an outline of broker opinion which points to the likelihood of a substantial upside rerating in the near to medium-term. In mid-October Finfeed drew investor’s attention to the improving medium-term outlook for uranium with a number of factors contributing to increased demand in a relatively flat supply environment. The fact that US and European utilities will commence re-contracting for uranium in 2018 could be a particularly important commodity price driver. In particular we highlighted the prospects of Berkeley Energia (ASX: BKY), an emerging producer that is developing the Salamanca project in Western Spain. Michael Stoner from Peel Hunt has just initiated coverage of BKY, and he is forecasting first sales to occur in fiscal 2019 just in time for the company to benefit from the anticipated commodity price rally. 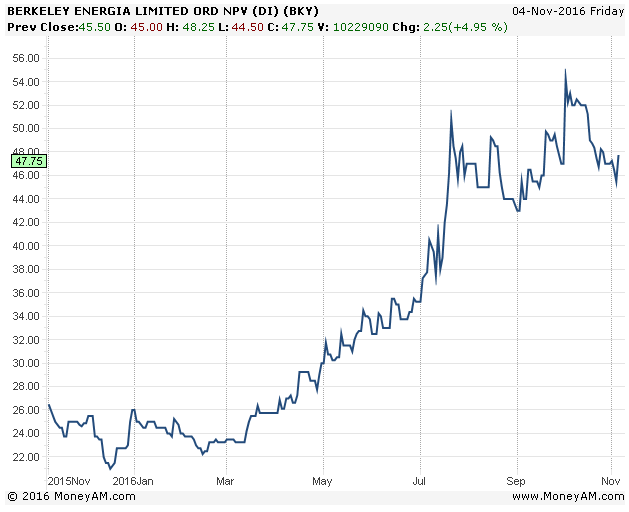 BKY’s share price has performed well in the last six months, increasing by more than 50% from just shy of 60 cents to hit a five-year high of 90 cents in early October. A key catalyst was the release of the Salamanca Definitive Feasibility Study (DFS) where project metrics indicated BKY is on the verge of developing one of the world’s lowest cost uranium mines. It should be noted that projections regarding production, commodity prices and financial returns may not be met. Also, historical share price performance is not a guide to future trading patterns. Investors considering this stock should seek independent financial advice. The DFS demonstrated that over an initial 10 year period Salamanca was capable of producing an average of 4.4 million pounds of uranium per year at a cash cost of US$15.06 per pound. 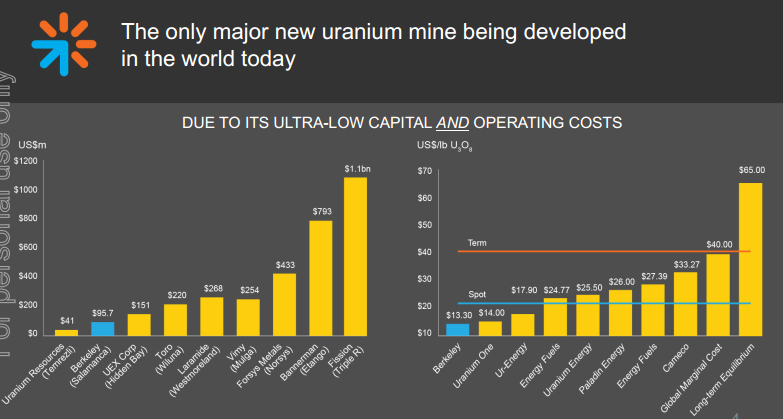 Even based on the fairly depressed uranium price of US$26 per pound this represents healthy margins. As a means of comparison, Stoner estimates that the industry average production cost is more than US$30 per pound. Paul Smith from London based broking firm, WH Ireland crunched the numbers after BKY released its DFS, highlighting the fact that should the current term uranium price of circa US $40 per pound remain at steady-state (most brokers are predicting significant upside from this level) Salamanca still generates an internal rate of return of 40%, representing a superior return compared with many large operations currently in production. With regard to production volumes, as outlined by Stoner below it is mainly large players with market capitalisations in the billions of dollars that have higher production rates. This not only demonstrates the high profile nature of the Salamanca project, but as Stoner said, “The clear takeaway from this data is that Salamanca is of a scale that is normally owned by the majors”. 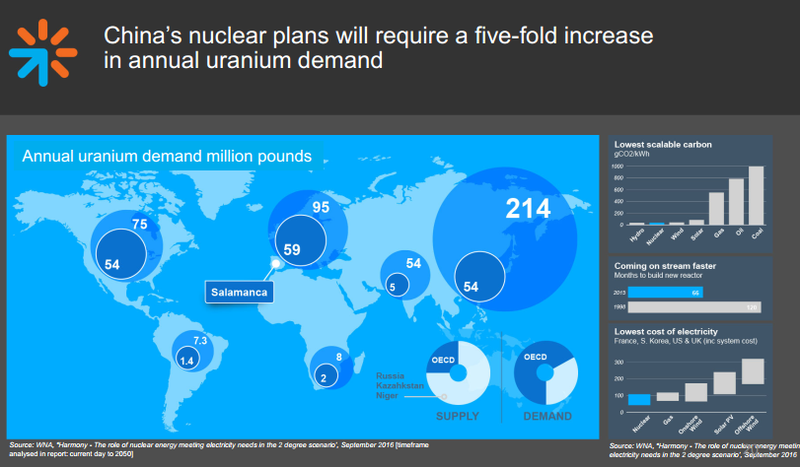 Consequently, there is the potential for one of the majors to make a play for BKY, particularly given there are limited opportunities in the way of advanced uranium projects. 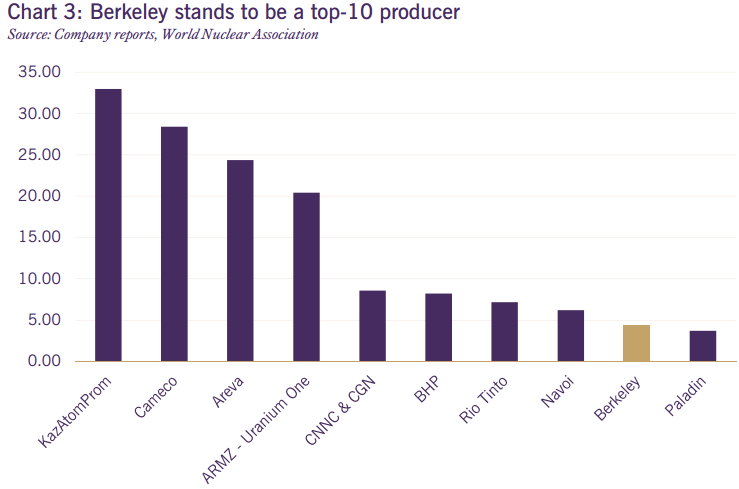 As indicated below, once in production BKY will be the ninth largest producer in the world, but if the likes of BHP or Rio Tinto were to take out BKY, the additional production would elevate either company to clear fifth ranking by annual production, an added incentive to harness BKY’s production given that volumes translate into pricing power. 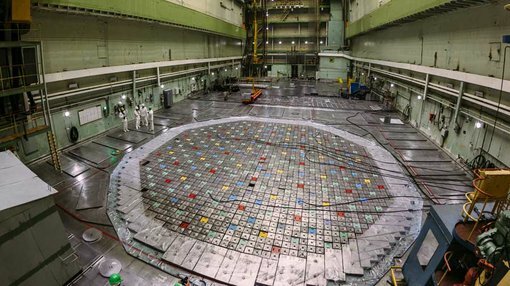 Stoner sees the level of long-term contract cover by US and European utilities as a growing concern, and in the context of a flurry of reactors being constructed in China and a lack of new mines advancing towards production he expects a sense of nervousness by the majors will trigger a two-stage rerating. Stoner said, “The data points to a two-stage tightening of the market, firstly in 2018-2021, with the US contracted volumes falling significantly, and then again in 2021-2023, when the European reactors look to re-contract volumes. 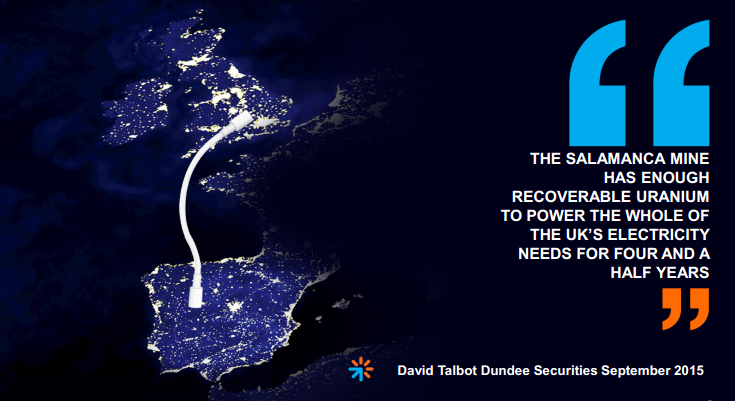 He believes it is difficult to predict when the competition for supply will kick off, but with the period 2019 to 2023 being the stage when utilities roll out of contract and into the spot market in a significant way, one would expect the price response to happen well ahead of time. Given this backdrop he sees an uplift in the spot price occurring in 2017/2018, but acknowledges that there is poor visibility regards current stockpiles. Assuming inventory stockpiles are running at high levels a market tightening could be deferred until 2019/2020, which still coincides with when Salamanca first delivers meaningful annual production. Stoner’s modelling of potential production from BKY’s assets is outlined below. He expects BKY to generate revenues of US$143.7 million in fiscal 2019 from estimated production of 2.6 million pounds. Based on Stoner’s modelling this would generate a net profit of circa $46 million, representing earnings per share of US23.5 cents or circa AUD$0.31 based on prevailing foreign exchange rates. 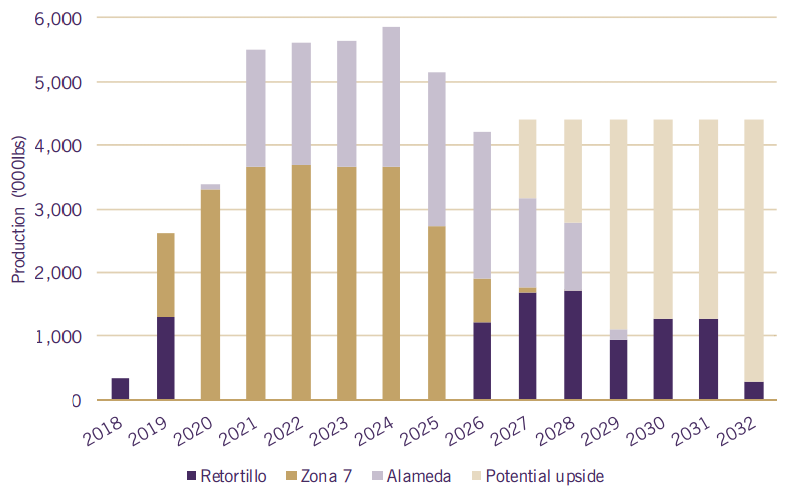 It is worth noting that broker projections that have been framed over recent weeks and months regarding production and revenue timing may change now that BKY has taken the decision to accelerate the development of Salamanca. We will keep investors appraised of broker updates as they occur. It should also be noted that broker projections regarding production, revenues and earnings are only estimates and they may not be met. Investors considering BKY should seek independent financial advice. In terms of comparing broker estimates, Paul Smith is forecasting production of 2.4 million pounds in 2019, generating revenue of US$140 million and EBITDA of US$106.8 million. These figures are more bullish than Stoner’s at the EBITDA line as he is forecasting $80.3 million from similar revenues. However, Stoner has factored in finance costs of circa US$21 million in fiscal 2019, while Smith didn’t commit to a particular financing strategy. However, he did note that the company has disclosed its preferred funding route to be through the sale of a minority interest in the project to a strategic partner at a valuation that reflects the net present value of the project. This would be an ideal outcome for BKY as the funding package would be representative of the value of the project with both parties incentivised to make it work. Furthermore, there wouldn’t be the earnings per share dilution associated with a further equity raising. Matthew Keane, an analyst from Argonaut, also likes the stock and taking into account DFS projections and a similar production profile to other brokers he values BKY’s assets at $2.05. Keane has a buy recommendation on the stock and his price target is in line with the asset valuation, implying upside of nearly 190% to Thursday’s closing price of 71.5 cents. It is worth noting that the slide in BKY’s share price from 90 cents on October 4 to its current level has in part been driven by a plunge in the S&P/ASX 200 Energy index which has fallen from a high of 8960 points on October 11 to an intraday low of 7937 points this week. Looking at the big picture though, over the last 12 months the Energy index has fallen from circa 8900 points to approximately 8000 points, while BKY’s share price – despite the recent retracement – is still up 40%, having increased from 51 cents on November 4, 2015 to yesterday’s close of 71.5 cents. Given the company is being valued by brokers (and no doubt by institutional investors) on medium-term earnings and asset values it could be argued that the knee-jerk reaction to a sell-off in energy stocks, which for the best part is oil price related, is unjustified. 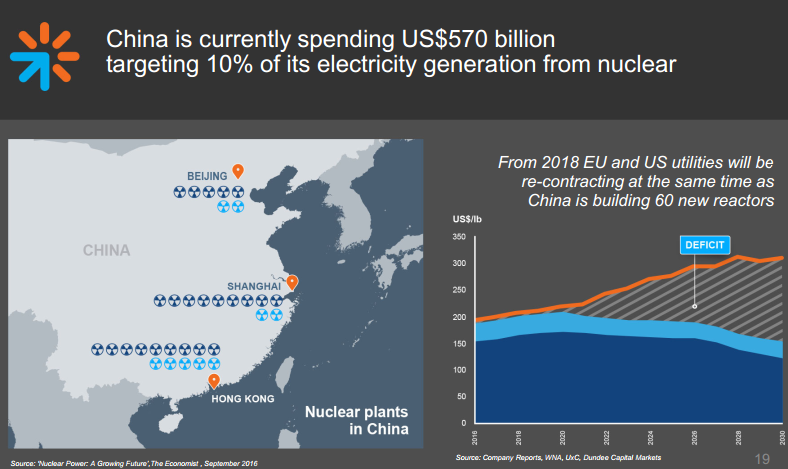 Investors should keep in mind the medium term picture which is the following demonstrates indicates that China’s nuclear program alone will trigger a fivefold increase in uranium demand. If the capital raising places the stock back on the radar and perhaps indicates that Salamanca could come into production earlier than originally planned BKY could return to levels reached in early October and beyond. Given the weight of opinion from increased analyst coverage this could happen sooner rather than later, suggesting the recent retracement may represent a useful entry point.